1. Buy the right luggage. Don't let your luggage define your travels, let your travels define your luggage! If you're planning a multi-city backpacking trip through Europe a 4-wheel, 28-inch roller suitcase will be difficult to travel with. 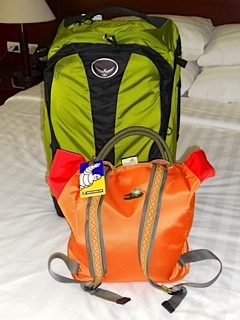 A lightweight bag with convertible backpack straps would be a more appropriate choice for such a trip. No matter where you're going be sure to choose something that will serve you well! 2. Make a packing list at least one week in advance. This will give you time to figure out what you have, and give you time to go shopping for any necessary items you may be missing. 3. Pack simple styled clothes in maintainable fabrics. Fabrics like merino wool, pima cotton, bamboo, and polyester blends are easy to wash, quick drying, and don't wrinkle. This makes them fantastic travel fabrics! 4. Choose a color scheme and stick to it. This will allow you to easy mix and match your clothes to create a variety of outfits. 5. Pack small toiletries and remove all excess packaging. This will allow you to utilize the maximum amount of space in your 3-1-1 bag. 6. When in doubt, leave it out! If you're not sure if you'll need it, you probably won't. Save your precious carry-on space for the essentials! 7. Pack your bag and walk a quarter mile with it. If it's too heavy, reduce your load. You also should be sure that you can lift your bag over your head - you're probably going to have to put it in the overhead bin! 8. Wear all valuables in a security wallet, even on short trips. In the case of passports and money, it's better safe than sorry. Keep these extremely valuable items in a money belt or neck pouch. 9. Mail home souvenirs and purchases as you travel. Did you find a gorgeous tribal mask or one-of-a-kind painting that you simply must have? Buy it! Then mail it home so your beautiful new purchase doesn't weight you down during the rest of your trip. 10. Don't forget your smile, sense of humor, and flexibility. Chances are you'll hit some bumps throughout your travels, but as long as you've brought your positive attitude you'll make it through with no problem at all. And hopefully, since you're traveling with carry-on luggage, you won't have to deal with any lost luggage!